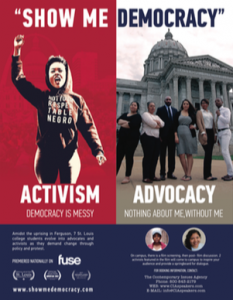 Amidst the storm of the Ferguson, MO, shooting, seven St. Louis college students evolved into advocates and activists as they demanded change through policy and protest. From 100 hours of footage shot over two years, the film Show Me Democracy has been woven into a powerful story of young people engaged in key issues: race, immigration, higher education equity, economic disparities, and more. Show Me Democracy is the powerful documentary about those efforts that premiered nationally on FUSE TV as the opening film for their “We the Dreamers” series. The film functions as a powerful tool that educates young people on not only the need for educational advocacy, but the power they have to affect change for themselves and those around them. Too often young people are dismissed, as a group without the right to have their views considered or their interests independently represented at any level of decision making. One of the film’s taglines illustrates that well – “Nothing about me, without me.” Your audience will realize they have the capacity, potential, power, and right to speak up on those issues that directly affect them and their peers. 15 Page DIscussion GUIDE INCLUDED with the program. Activism, Advocacy, African American studies, Civic engagement , Civil rights, DACA, Democracy, Educational Equity, First Generation College Students, Immigration, Political science, Police ethics, Poverty, Racism , Undocumented immigrants, Voting and more. On campus, there is a film screening, then extensive post- film discussion. Two of the film’s subjects will come to your campus. Brittany Ferrell is a St. Louis native and alumna of University of Missouri – St. Louis. Ferrell currently works as a Labor and Delivery nurse and has a passion for providing healthcare services and education. Ferrell dedicated time and passion to the Ferguson Uprising which was a spark for what is now known as the Black Lives Matter Movement. She has organized several protest and radical actions calling people with innate privilege and power to speak up about the inequities and inequalities that exists for black people and people of color in St. Louis, MO. Moving forward, Ferrell remains committed to working for justice and equity for black communities and communities of color in the best way she knows how. As an aspiring Family Nurse Practitioner and Certified Nurse Midwife, Ferrell is planning to apply for a dual degree graduate program for the Fall of 2018 year. Everything went great!! Both Karina and Brittany did an excellent job with engaging the audience. They both were every authentic and fun. They stayed after to chat more about the video with some of our students and community members. Thank you so much for all your help with this. Just wanted to say thank you and Show Me Democracy so much for all your help and in bringing the SMD experience to MCLA. The students and the north Adams community really enjoyed the event. Karina and Brittany did an amazing job keeping the audience engage by having a personal conversation with them and sharing their experience. They were very authentic and transparent with the audience which was really appreciated.Again, thanks to you, Karina and Brittany for bringing the experience of activism and advocacy to MCLA. Just watched the documentary. OUTSTANDING!!!!! I’m a police officer in St. Louis and this movement is truly taking an affect on how we are changing the way we police and encouraging dialogue between the community and police. Trust me when I say, your efforts are making a difference. The battle for education reform is phenomenal as well. A few students commented on how much they appreciated you breaking down Black Lives Matter and explaining the difference between democracy and wanting change versus what we see in the media with the riots and violence so many times. Also, you did a phenomenal job addressing how different black on black crime is from authority abusing their power…Overall, the students I spoke with and myself felt incredibly empowered and motivated by your film. There are so many injustices happening with racism in all spectrums of our city from police brutality to improper education. The documentary we were assigned to coincide with the topic made me realize I really didn’t understand the protests and what was going on in the world for people who were not white. After doing the research I have gained an entirely different perspective about the world I live in. It is a constant struggle [to] not laugh when someone makes a joke or to stop myself from stereotyping anyone but I admit to it. I am trying to make this change so I am not as naive and I am prepared to teach my children the importance of trying to understand a situation, or person, before forming an opinion.